An exciting trail around "Goat Mountain" (1730m), through valleys and beautiful forests. 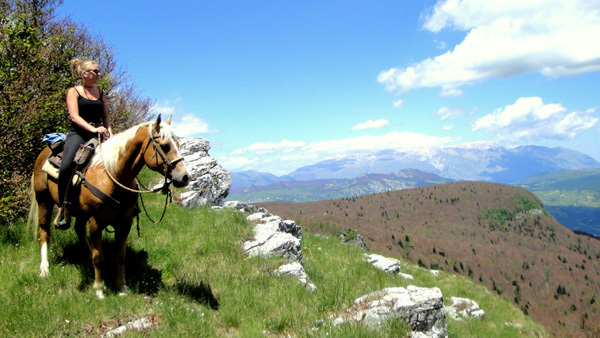 Here you can explore this stunning countryside from the back of a kind and easy-going horse and enjoy some delicious Italian food. 7 nights, 5 ½ days ridning (5 - 6 hours per day). Min. 6 persons and max. 8-10. You are expected to arrive on Saturday evening. After a welcome drink there will be dinner with your host/guide. A three-course Italian dinner will be served every night, accompanied by local wines. The morning is yours. You may sleep late, take your time over breakfast, do whatever you like. Before lunch there is a safety-briefing. Then we groom and saddle up the horses, followed by a short demonstration in western riding. 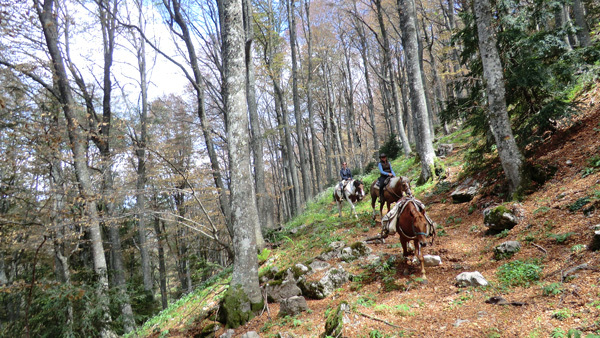 After lunch we do a test-ride (three hours) to enable you to get acquainted with the horse you are going to ride on the trek. Dinner and BB are at the farm-house. At about 10 a.m. we leave the house. Today’s destination is Capracotta. This little village (500 inhabitants) is situated at 5,200 ft, which makes it one of the highest municipalities in Italy. Curiously the name literally means “cooked goat”. Before lunch we ride through endless fields. After 2,5 hours it is time for a delicious picnic. After this we make a lengthy canter through a long valley. At the end Capracotta dooms up, but it will take about two hours of riding to get there. We are staying at a hotel and dinner is at a restaurant. Today we will make a day-ride and climb “il Monte Campo”. 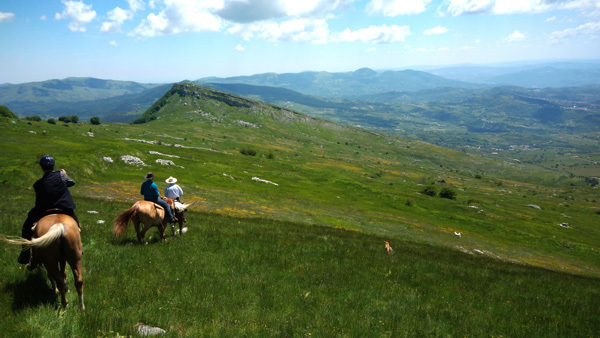 The highest point is at 5,235 ft. From here we get a gorgeous view of “Alto Molise”and the Abruzzo. After this we follow cross-country skiing slopes, which lead through a wood of silver firs. Picnic is at the Rio Verde (green river). A little later we arrive at Prato Gentile, which literally means “kind meadow”. 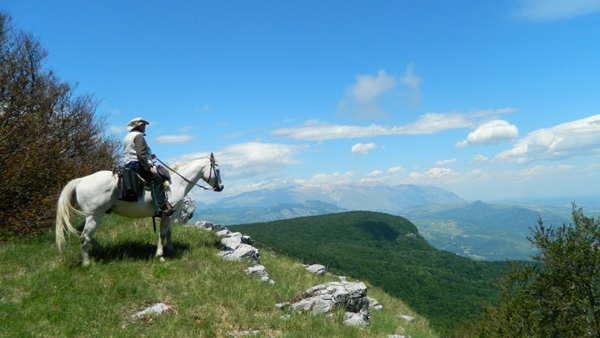 In the afternoon we descend to Capracotta and ride through an open landscape with many meadows. The night will be spent at the same hotel, but dinner is at a different restaurant. After a few canters we follow a gravel road, which gradually goes upwards. 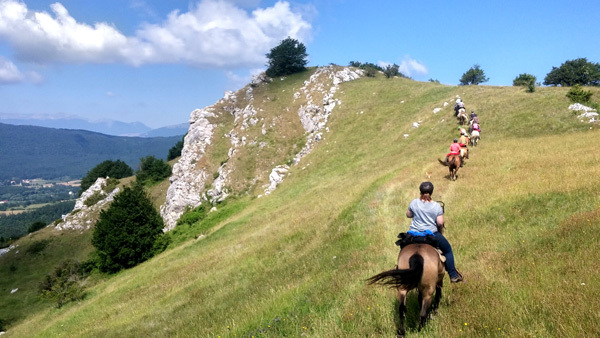 The horses enjoy their breathing space while we riders enjoy the view of four different mountain ranges, namely the Colle dell’Orso, the Matese, the Mainarde and the national Park of Abruzzo. After picnic the trail leads us into the direction of the little village San Pietro Avellana. Outside the village we leave the horses in a field were we have to make a paddock with electric wire. We sleep in B&B and go out for pizza. After about an hour we pass Montedimezzo which used to belong to the royal family of the Bourbons. The hunting lodge nowadays is a museum. The forest is protected by UNESCO. Worldwide this organisation protects 256 forests. Four of them are located in Italy; two of which in Molise. Then we ride to “il re Faione”. This “King of beech-trees” is almost 500 years old. We have picnic on the top of a hill with a nice view of the sorroundings. After this it will take two hours at the most before we arrive at Littorio’s “agriturismo”. Up till quite recently he used to keep horses, so the paddocks next to his house are for us to use. After breakfast we follow part of the Tratturo Castel di Sangro-Lucera. A Tratturo is a 2.000 years old track that is still used to move cattle from the far south where grass is scarce in summer. Around midday we reach Pescolanciano. Here we stop for lunch, which will be served at a little restaurant. In the afternoon we climb the hills that border on the forest of Collemelucio. This is the other forest protected by UNESCO. The project is called Man and Biosphere (MAB). The last few miles on horseback take us over open heath land and dense oak-woods. About 5 p.m. we are back at the farm-house, unsaddle the horses for the last time and enjoy the farewell dinner. N.B. Due to weather or other unforeseen circumstances the programme may have to be adapted.